Mythology/history – Tanzanite was first discover in Northern Tanzania in 1967 and was named Tanzanite by Tiffany & Co after its country of origin. The American Gem Trade decided to make Tanzanite the birthstone for december in 2002. 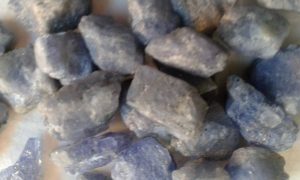 Tanzanite vibrates at a very high frequency which will assist in helping you connect to the Angelic realm, ascended Masters and higher vibrational beings. It also can download the Akashic record – which are a compendium of thoughts, events and emotions believed to be encoded in the astral plane. Enhances deep meditation and allows you to visualize to a higher level. It changes colour depending on which direction it is held. Tanzanite helps to dissolves old Karma, reduce stress and slow down in your day to day life. By using Tanzanite you can find an inner calm and peace that helps to bring balance into your being. Healing – Works on all issues relating to the head, throat and chest, dissolves disease. Tanzanite should be worn for a long periods of time in direct contact with the body. Can be used in all meditations to deepen and enhance, and is great for group meditations. Tanzanite is wonderful with gridding work.